For Windows Developers who need to Desktop Live Streaming to Facebook Live, Youtube Live, Twitch or Wowza Media Server or Screen recording to video files with C++ , C#, VB.Net , VB, Delphi, Vfp, MS Access. RTMP Live Streaming your Screen or specific window to Facebook Live, Youtube Live, Twitch, Wowza Media Server or Adobe Media Server. Support GPU Acceleration(NVIDA, AMD, Intel) when capturing to MP4 file. Custom NVIDA Preset. it can minimize usage of CPU , let the output video quality is better or output Low-Latency MP4 file. 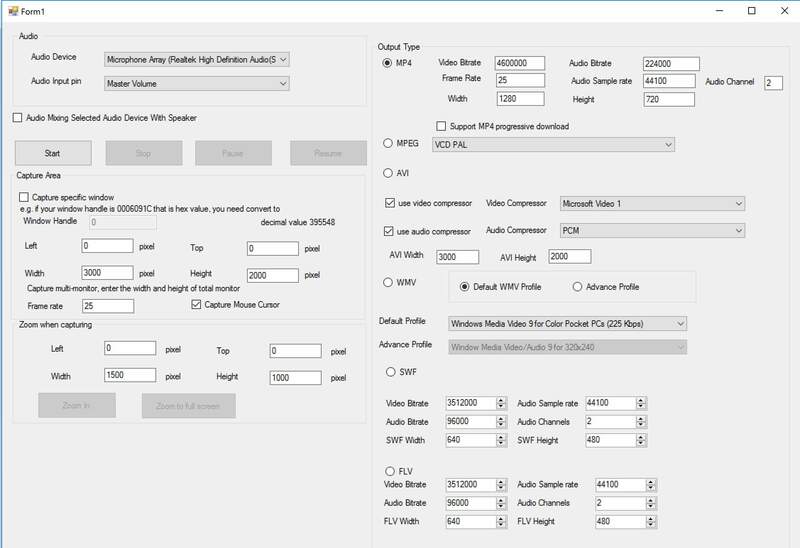 Set the NVIDA Preset if your computer support use NVIDA GPU for capturing to MP4 file. Include c# 2015, c# 2010, 2005, VB.NET 2015, VB.NET 2010, Delphi, VB , VC , VFP Sample source code. added MP4GPUCodec property. When encoding to MP4 file with GPU Hardware Acceleration. It support use NVIDA , AMD and Intel Core GPU technologies to output MP4 file. added RTMPFPS property that set frame rate when RTMP Live Streaming screen activity. added RTMPMinGOPlength property that minimum length of the GOP when RTMP Live Streaming screen activity. added viscomscreen2mp4encoder.dll file that will use some new dll files. 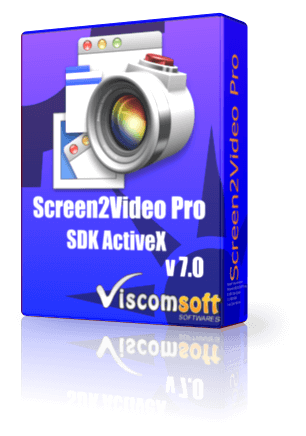 added viscomscreen2mp4encoderNoGPU.dll file that will using on Windows XP only. 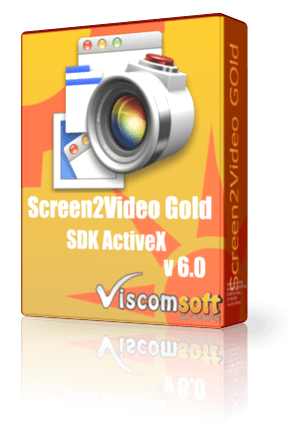 updated the trial version installer that will installing viscomscreen2mp4encoder.dll or viscomscreen2mp4encoderNoGPU.dll depend on the OS. updated C#2010, C#2015, VB.NET 2010, VB.NET 2015, VB6, VC General and RTMP samples. added Audio Mixing with specific playback device. e.g. 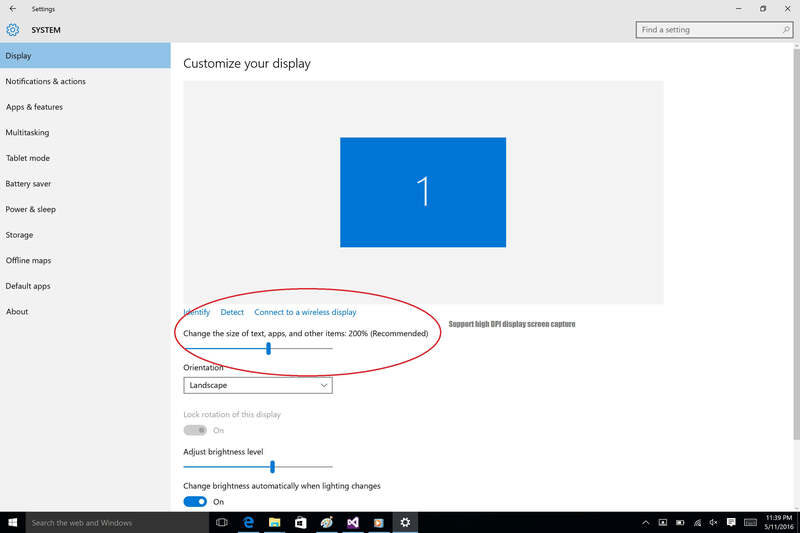 If you plugged USB headset, you will have more than one speaker device (playback device) on windows. added GetPlaybackDeviceCount method to Get the count of playback devices. added GetPlaybackDeviceName method to Return the name of PlaybackDevice for specific index. added PlaybackDevice property, it can Audio Mixing with specific playback device. updated VB6, C# 2010, C# 2015, VB.NET 2010, VB.NET 2015, VC samples. fixed if mouse dragging for moving application when RTMP Live Streaming, The application will crash. fixed screen color issue when RTMP Live Streaming. fixed cannot Live Streaming if selected no preview (RTMPDisplayWindowHandle=0) when RTMP Live Streaming. fixed cannot output FLV and SWF issue. added if no audio device on computer, it can RTMP Live Streaming. added How to Live Streaming to Facebook Live documention. added How to Live Streaming to Youtube Live documention. fixed when output MP4 video, it have 2mm black line at the bottom. added MP4AspectRatio property, it can enable or disable aspect ratio when output MP4 file. added support RTMP streaming to Wowza Media Server. added StartRTMP, StopRTMP, RefreshAudioDevice methods. 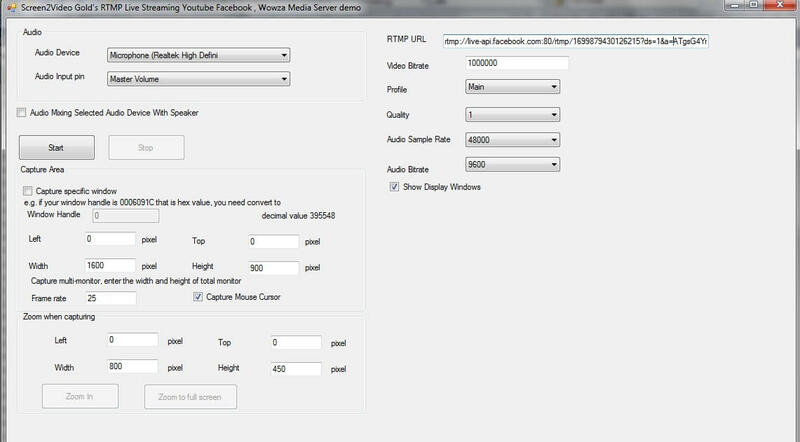 added RTMPDisplayWindowHandle, RTMPVideoQuality, RTMPH264Profile, RTMPAudioBitrate, RTMPAudioSamples, RTMPVideoBitrate, RTMPUrl properties. 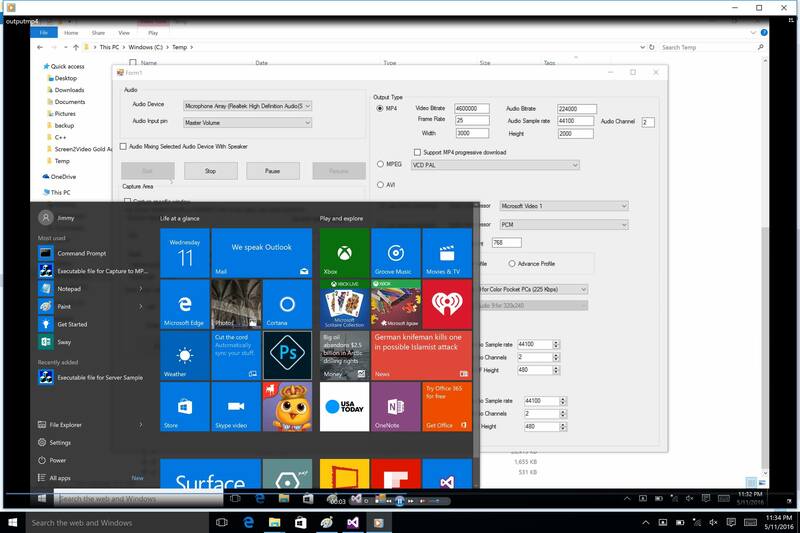 added How to streaming to Wowza Media Server or Adobe Media Server tutorial on Documentation. 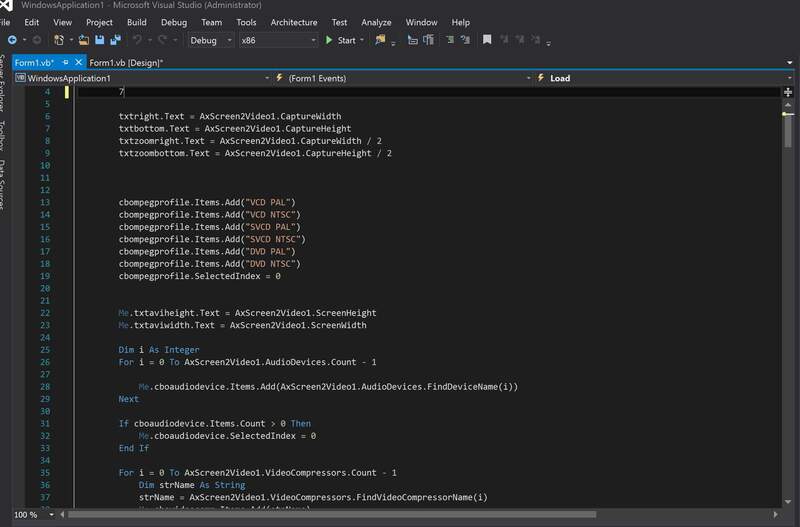 added VB6, C# 2010, VB.NET 2010 RTMP Streaming sample. added new H264 MP4 Encoder, now capturing is very fast and custom define MP4 resolution, Video/Audio Bitrate, Audio Sample rate, Audio Channels , it does not need use predefined MP4 Profile. added support add metadata when output MP4 video. fixed memory issue when recording. added more MP4 Profile, 720x540, 746x438, 770x460, 800x600, 970x606 profile. updated VB6, VC , VB.NET 2010, C# 2010 samples. Show you how to capture specific zone when output MP4 file. added support output progressive download MP4 file. This features is useful for MP4 streaming. Record screen activity, mouse movement to mp4, vcd, svcd, dvd, swf, flv, avi ( compressed or uncompressed), or wmv files.